Happy Wednesday everyone! I wanted to post a blog about thanking everyone who has been tuning in and even following my blogs. I am an amateur at this and i am overwhelmed with the positive feedback i have received. I have my editor (girlfriend) who has been proof reading and making sure i don’t make too many grammatical errors lol. All in all, i am very happy with everyone who has been reading and following my blogs, thank you guys! and i hope i continue receiving plenty of new subscribers and readers! Now, onto the good stuff. Today’s topic is a bit interesting and certainly might have a lot of people with different views on the subject. I have recently been reading the book “100 Heartbeats” written by Jeff Corwin, in which he talks about endangered species and the work he has done in trying to protect them and prevent them from becoming extinct. I have been enjoying the book very much, his writing is very simplistic and the experiences he has with these animals are amazing. The information and emotion this book has to offer, makes it a great book to read, as well as an amazing learning experience. I became fascinated with the topic of endangered animals and started looking at animals that were already extinct in this century. I came across the Thylacine or the “Tasmanian Tiger” and came across videos of it and looking into information on how it became extinct. 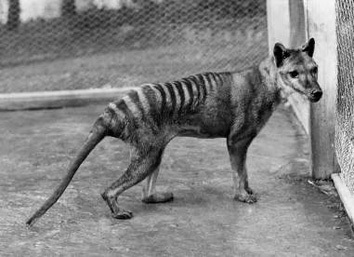 The last Thylacine died in 1936 and it was said that they were exterminated by humans, due to the misconception that the Thylacines were the primary cause of attacks on sheep. Farmers and people who settled into Australia were constantly hunting down these animals because they thought they were killing all their livestock. There were other factors contributing to the extinction of this animal, including competition with wild dogs, and erosion of it’s habitat. Stumbling across videos on youtube on thylacines, i adored it’s appearance. It looked like a wild dog, had stripes like a tiger, and had a pouch for it’s young, like a marsupial. All these fascinating attributes it had, and to find out, it was neither a feline nor canine, but a marsupial! Just realizing that this amazing looking animal was a marsupial put me even more in the mood to finding some sort of documentary on it. “Cloning the Tasmanian Tiger” was the name of the documentary. It is a 50 minute documentary and i had plenty of spare time so i decided to watch it. The video in my opinion is very informative and a great topic. The title says it all. A director at a museum in Australia wants to clone a Thylacine and the question is not whether he could, its whether he SHOULD. The documentary brings up interesting topics on whether cloning should be allowed or not but it is much more complicated. If only every scientific debate were black or white, the world would be much simpler, but it is not. I honestly have mixed feelings about this subject. Should we really be playing god and simply recreate any extinct animal we want? Will cloning extinct animals make people less concerned over conservation issues because they will think “hey, if the animal becomes extinct, science will just create it again”. I do not know how people will react but i don’t see why people would care about preserving species when they know that science can bring it back from extinction. The whole point of conservation biology is to PREVENT animals from becoming extinct and it’s not only animals, but an entire ecosystem! I personally think if we fall into this type of lifestyle, we as humans will ultimately not care about preserving anything, whether its an ecosystem, habitats, or the animals that live in them. We already are greedy enough to destroy homes of any type of species, no matter how important they are to the ecosystem. As i stated before, things are never black and white and one opinion is never the right one, especially for this delicate topic. What do you think should happen? should we bring back a species, that we ourselves have wiped out? Do you think bringing back a species from the dead is something we must do in order to improve the biodiversity on this planet? I am all ears on different opinions and would love to hear yours. 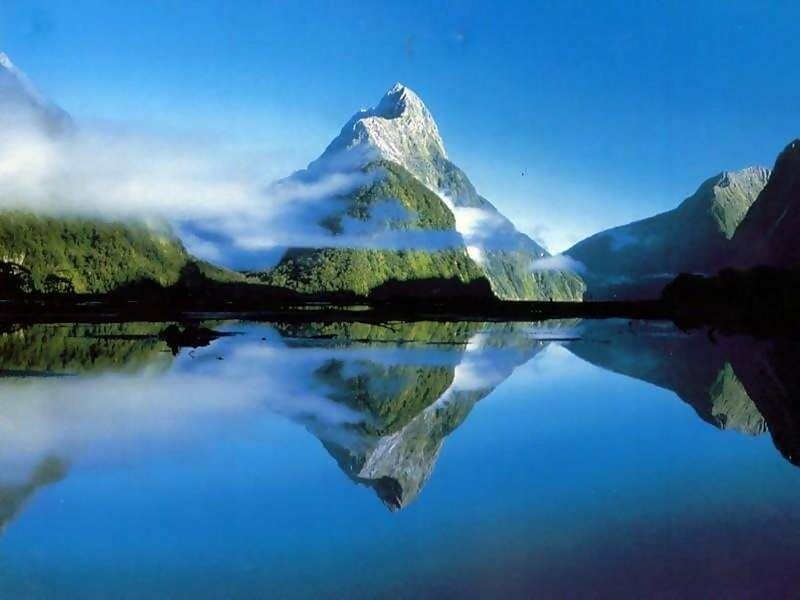 One thing that extinct species should remind us, is that there is a delicate balance on this planet and everyone is playing an important role. The more species we wipe out from the planet, the more problems we will ultimately face from the environment. In this world, there are a million problems that we are working on to resolve, including ones on our very own country. But as a researcher and naturalist, we all deserve the right to live on this earth. We all depend on each other for survival.